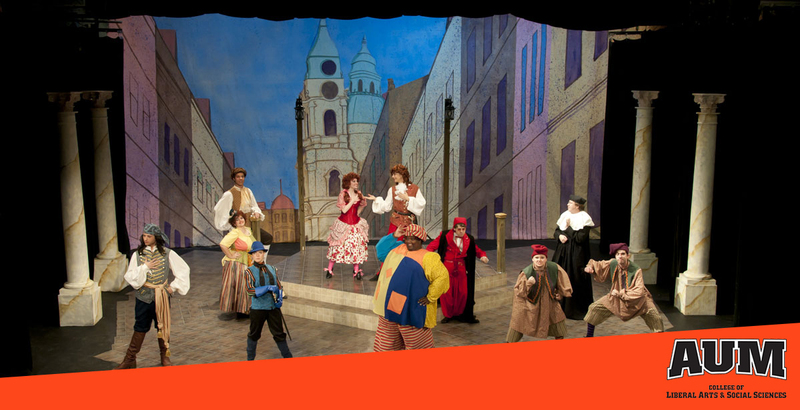 The award-winning AUM Theatre program’s strength is preparing students for careers as performers and as technical directors, property artisans, set designers, costume designers, makeup artists, stage managers and more. You’ll learn by getting one-on-one coaching from the faculty and hands-on experience. At AUM, as you learn about all aspects of play production, you’ll also cultivate traits that will serve you well in any field — confidence, self-discipline, dedication, and teamwork. Theatre is a concentration within the Communication major. AUM students regularly participate in the Kennedy Center American College Theatre Festival, the Alabama Conference of Theatre, and the Southeastern Theater Conference. AUM students have earned paid summer internships or entry level positions all over the country at venues such as Alabama Shakespeare Festival, Montgomery Performing Arts Center, Alabama Dance Theatre, Theatre West Virginia, Texas Shakespeare Festival, Utah Shakespeare Festival, Davis Theatre, Birmingham Children's Theatre, Red Mountain Theatre Company, Pioneer Playhouse, Tecumseh Outdoor Drama and the Brevard Music Center. A degree from this program will prepare you for the 46,000 new jobs projected to be added to the economy from 2014 to 2024. This 6 percent job growth in entertainment occupations will be about average. At $39,700, the 2014 median annual wage for entertainment occupations was higher than the median annual wage for all occupations. Laura Bramblette is the sound editor for Jim Robbie and the Wanderers podcast and has appeared in Town of the Living Dead on the Sci Fi Channel. Daniel Brown is director of audience services at the Texas Shakespeare Festival. Brittany Carden has appeared in TV’s Bones, Brooklyn 99, Mistresses, and Supergirl. Introduction to Human Communication: An introduction to the basic concepts involved in the study of speech communication and the application of these concepts through performance in various contexts, such as interpersonal, small group and public address. Public Speaking: Structure, style and delivery of various types of speeches for different occasions. Theory and study of current examples combined with practice. Stagecraft: Study and practice in theatre stagecraft, focusing on construction methods, scene painting, rigging and handling of scenery and backstage organization. Stage Lighting: Study and practice in theatre lighting, including designing, hanging, focusing, maintaining and repairing stage lighting instruments. Students will produce light plots and paperwork needed for production. Costume Construction: Study and practice in theatre costuming, including pattern drafting and cutting, basic sewing techniques, construction methods and backstage organization and maintenance. Students in this course construct costumes and may serve as running crew during the semester’s productions. Fundamentals of Acting: Study and practice of basic acting theory and technique. Scene Design: A fundamental design course geared toward enhancing basic principles of scenic design and developing a practical knowledge of all drawings pertaining to theatrical design. Dramatic Literature and Theatre History of the Western World I: Traces dramatic literature and theatre history from the rituals of ancient civilizations to the middle of the 19th-century. Dramatic Literature and Theatre History of the Western World II: Traces dramatic literature and theatre history from the mid-19thcentury to today. courses. May be repeated for additional credit. The practice and theory of expository writing; the command of language for clear and forceful communication of ideas. Attention given to practical composition, including research writing and writing in special fields. Literary Criticism: A study of the history and fundamental principles of literary criticism from Aristotle to the present.